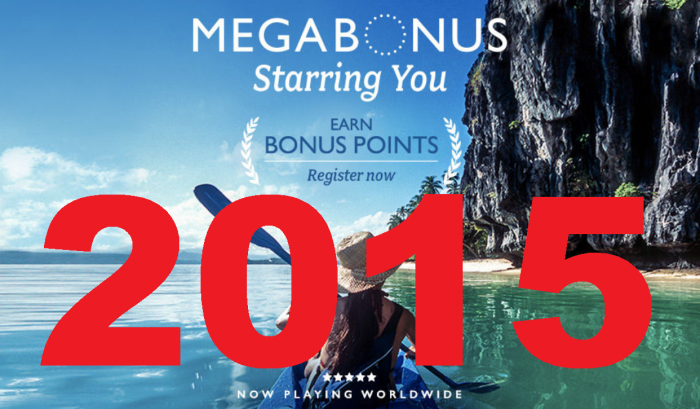 Marriott Rewards MegaBonus 2015 for stays between September 15 – January 15, 2016, is now open for registration that must be done by November 15. There are several personalized offers based on your individual stay history. The base offer, however, is double points starting from your second stay for up to 20,000 bonus points. 1. Double points starting from your second stay for up to 20,000 bonus points. 2. Earn 2,000 bonus points per stay starting from the second one for up to 20,000 bonus points. 3. Earn 15,000 bonus points after 15 nights plus additional 2,000 bonus points per additional paid night for up to 35,000 bonus points. 4. Earn 25,000 bonus points after 20 nights plus additional 2,000 bonus points per additional paid night for up to 45,000 bonus points. Marriott Rewards should offer more bonus points for completing these targeted offers considering the award inflation over the past couple of years. The free night award certs still haven’t made their returns (used to be the best option for those that didn’t stay a lot). Marriott Rewards® members who register for this promotion by November 15, 2015, will earn double points starting with their second paid stay — up to 20,000 bonus points for stays made between September 15, 2015, and January 15, 2016, at participating Marriott® properties. Participating brands include EDITION®, JW Marriott®, Autograph Collection® Hotels, Renaissance® Hotels, Marriott Hotels®, Marriott Vacation Club, Gaylord Hotels®, AC Hotels by Marriott®, Courtyard by Marriott®, Residence Inn by Marriott®, SpringHill Suites by Marriott®, Fairfield Inn & Suites by Marriott®, TownePlace Suites by Marriott®, Moxy HotelsSM and Protea HotelsSM.